means “Gentle” and” Soft,”, “Jia家” means “Family” or “Style”. Rujia educates everyone should be gentle to each other and then society will be balanced. Rujia has 4 Classic books which contain all the teachings of Rujia儒家. In Chinese we call them Si Shu四書 means “Four Books”. The first book is Da Xue大學 means Great Study, which was written by Ceng Zi曾子, a student of Kong Zi. This book is mainly teaches us to have good personal morals. If we are right, then our family will be right, then our country will be right and then the world will be right. It is all based on our own personal training. It teaches us even when we on our own without other people watch us we should behave well. The second book is Zhong Yong中庸. This means, “Keep the Centre and No Changing”. Written by Kong Zi’s grandson Kong Ji孔伋.It means that in everything we do and everything we come across we should not go too far and keep the centre. It also say we should hold on to our principles and do not change them. This is what most practitioners of Rujia do, they do not express themselves so much, but behave very politely and present a good attitude. But when it comes to their principles and beliefs they are firm. 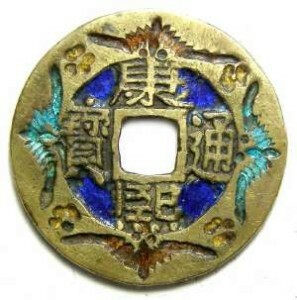 They are just like a Chinese coin, round on the outside and square inside.